White blossoms pepper the leaves of the strawberry patch in the back corner of our city lot. Planted several years ago by my firstborn Katie, during her season of in-between high school and college, they bloom year after year bearing luscious berries and sweet memories. The spring that she asked to dig up a piece of yard to plant some hand-me-down strawberry shoots, I was up to my eyeballs in caring for littles. The second batch of our eight children arrived over a span of five years, beginning when Katie was ten. They joined Katie, their eight year old brother, seven year old sister, and four year old brother. There was much mommy overload and distraction. Four littles plus four bigs equalled chaos. Having long given up the illusion of a pristine yard lifted from the pages of a home and garden magazine or blog, I agreed to her request. I did not have time to garden myself. The worst that could happen was the project would flop. At best, I would gain a strawberry patch. You have to know that was in the back of my mind. What was in this for me? Fruit began to bear. Literally, and figuratively. Buds began to form and bloom and ripen. Katie harvested berries and learned to whip up shortcakes and make jam. She allowed little siblings to pick and eat from her strawberry patch with permission and close supervision. Year after year the plants spread and the patch increased its borders. 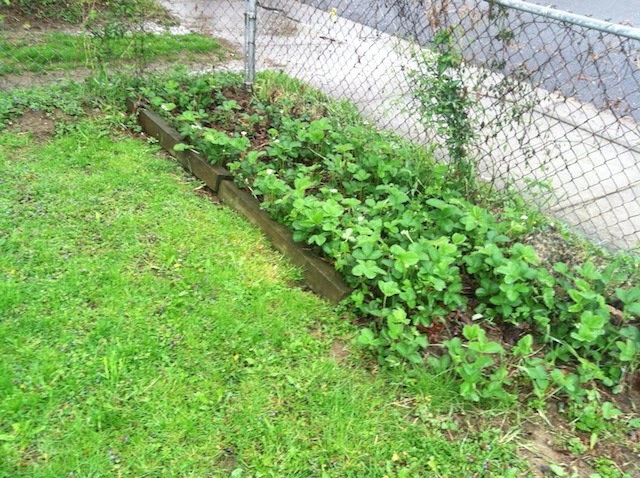 Strawberries grew. My daughter grew. I grew. Katie lived at home for two years after high school while attending a local community college. Upon completion of her associate’s degree, she moved away to finish her undergraduate work at a university. She returned home after that first year away to ripening berries. She tried her hand at planting kale. An attentive young man was more than willing to turn up more of our backyard for her gardening endeavors. Because I was preoccupied with her sister’s graduation from high school and all its festivities, Katie offered to plan her baby sister’s early June birthday party. Little Mae was turning five. This was a gift to me, as well, since baby sister and I share a birthday. I was grateful for the space to enjoy my day. Strawberry picking was part of the party plan, and a gaggle of little girls carrying plastic cups followed Katie to her strawberry patch. As I watched from the window savoring the sweet moment, I wondered how many more years my daughter would be living at home. One day she would no more. This could be the last year, I thought. Was it a premonition? Was it that my two best friends had experienced the marriages of their children that spring . . . to each other? Was it mother’s intuition? Whatever it was, that party was Katie’s final harvest of strawberries from her patch as an unmarried woman living at home. Last fall that attentive young man put a ring on her hand. This spring, she graduated with a bachelor’s degree and she returns home for two weeks to make final preparations for her wedding. I’m not sure that the berries will be ripe by then. I’m not sure that my heart will be ready. Last weekend my husband and I made our first foray into the yard to survey winter’s damage. Coffee mugs in hand, we walked over to the strawberry patch. Resting my mug on the nearby sandbox lid, I began weeding. I pulled out bits of this and pieces of that. The plants had sent out shoots and were planning a takeover of the fence line. My husband noticed Katie’s kale coming back and began to tidy its area next to the strawberries. I pulled at weeds, thinning a plant or two here and there. My mind was roaming and remembering. That’s when I had the idea. 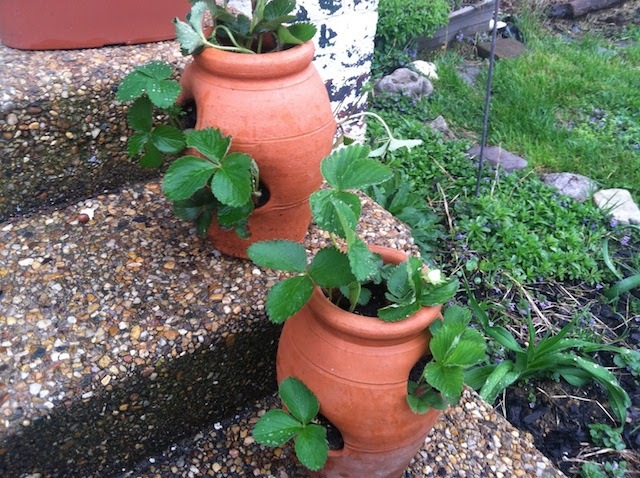 I remembered two empty strawberry pots bought many moons ago in a rush of domestic ambition and maybe some Pinterest envy. They now rested decorously against each other in a heap of rock and shard, adding interest to an overgrown flower bed along the side of the house. Into those well-rinsed pots I spooned some composted soil and added some of the thinned-out strawberry plants. I tried my Pinterest hand at making strawberry pots to grace my girl’s (and soon-to-be boy’s!) city apartment patio. Will my idea work? I don’t know, yet. I do know that there is a bloom on one of the plants and that whatever this next season of life brings for me and my girl, we, too, will bloom where we are planted. 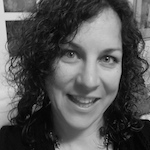 Julie McClay lives in Virginia’s beautiful Shenandoah Valley with her high school sweetheart (and husband of 22 years) and 5 of their 8 children. She is learning that while it can be painful to face the past honestly while living in the moment and looking towards the future, it can be healing and lead to eh the hope of a brighter future. She digs through these thoughts and feelings here. I LOVED this story Mom.And may i have extra video games? dogs would just LOVE it. My little girls are excited about this post and trying to use it to send me subliminal messages about video games (7 year old) and dogs (9 year old). Thanks for reading. Your heart is beautiful Julie! Awe, thanks, Friend. I will show this to my kids when they are not so sure. No extra video games and still no puppy here. Love you! Thank you so much for your warm and tender reflections. I praise God for your ability to demonstrate the power of reflection and observation. My tears at the joy and sorrow mingled in those reflections are heart tenderizing for me and trust they are for others as well. How wonderful God allowed you the opportunity to capture these things in your heart amid the busy times in your family. Thank you again for sharing. Thank you for your kind words. They were written and posted on my birthday, which feels extra meaningful to me, as I continue to grow into a place of hopefulness. Blessings! I heard and felt your heart in your writing – i believe I will remember your story every time I see a strawberry – so real – so full – so touching ! ” I am not sure the berries will be ready by then. I am not sure my heart will be ready.” I too have often felt that my heart needed time to catch up on the happenings of life.